The Madero Integra is a very practical and functional, standard rotary system that complies with the standards for a heavy-duty milking. The Madero Integra is an economical and functional rotary system, adaptable to any budget since each automation component can be added in a modular way. 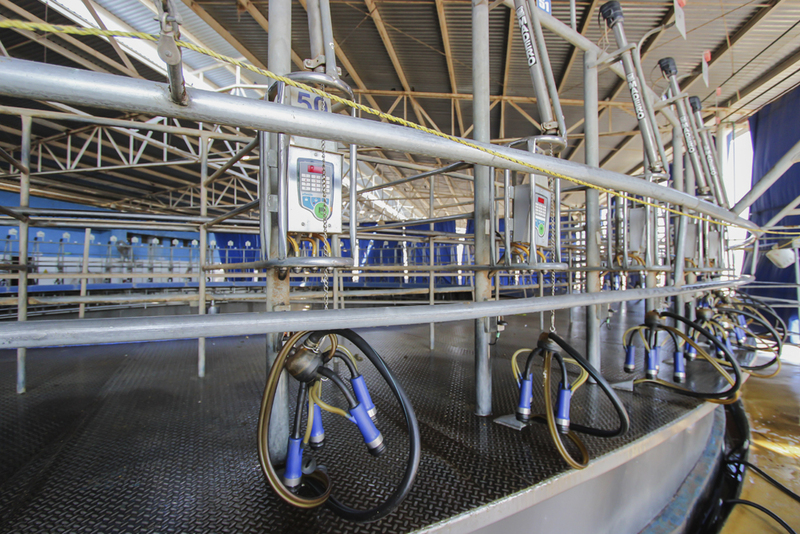 Its simple, practical and functional design gets to achieve the perfect combination between key variables and parts for an excellent quality milking and high performance. With a great execution, this low maintenance rotary system guarantees the functioning of your milking parlor 24/7 all year long. Always having in mind the profitability of your dairy farm, we designed and manufactured a lightweight system, with a structure resistant enough that optimizes energy consumption. It also provides the necessary strength to keep the platform working for years under the most extreme conditions. Easier and simpler maintenance for your platform. Having a wide space at the center of the platform allows the technicians to move in a free and relaxed way while they do maintenance, facilitating their task and reducing the time in which it is done. It is usually a hard task to keep the cows moving in the same direction. 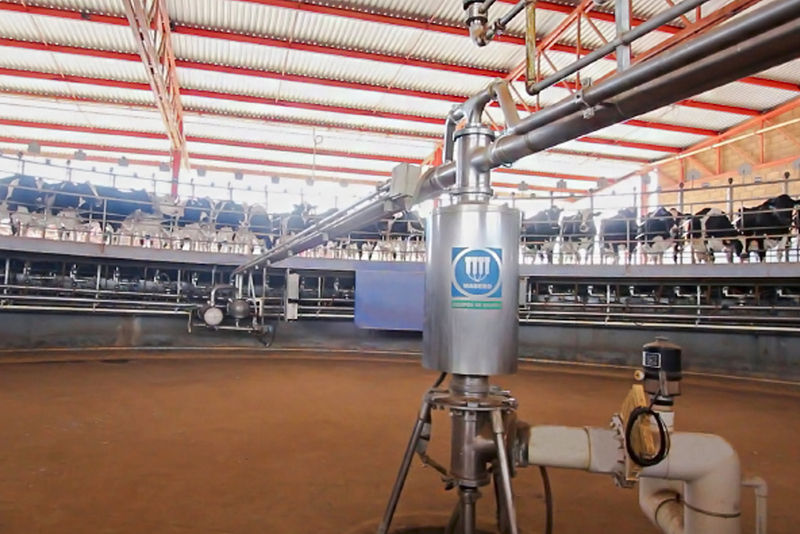 With the Madero Integra rotary system your cows get near the parlor in a constant flow with one cow going in and other getting out, always following the rhythm of the controlled platform’s rotation. Because the safety and comfort of your cows and milkers is important to us, the tear drop bails of our Madero Integra platform smartly place all the necessary components with the purpose of allowing a constant, comfortable and safe milking. 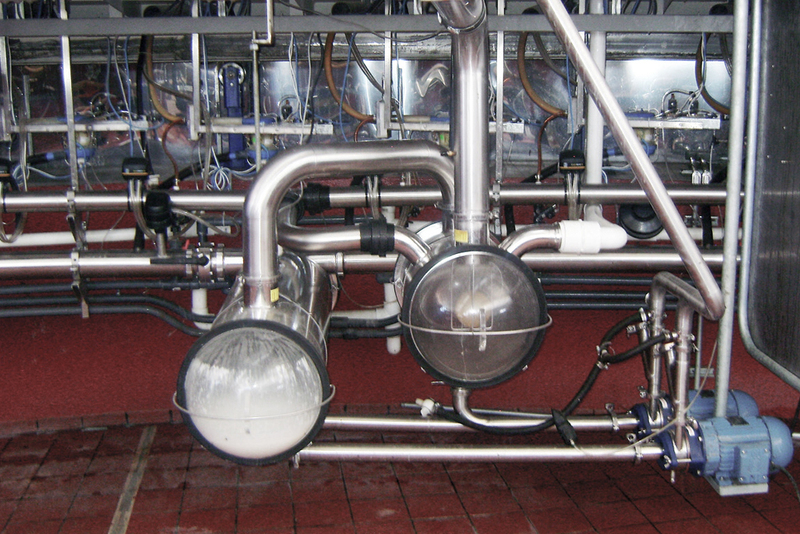 We have integrated to the Madero Integra platform a reliable, high performer milk receiver group with backup systems that guarantee an uninterrupted milking, capable of getting high milk flows and simultaneously transferring them in a soft and delicate manner to the cooling and storing systems. Its simple, practical and functional design together with its great resistance components and durability guarantee great performance in any type of environment and under any type of circumstances, all day long the 365 days of the year. The smooth and even rotation of the platform through its drive system allows a silent operation creating a relaxed and free of stress environment for the cows and milkers. Our platforms are the only ones that have a 15-year guarantee on the deck. 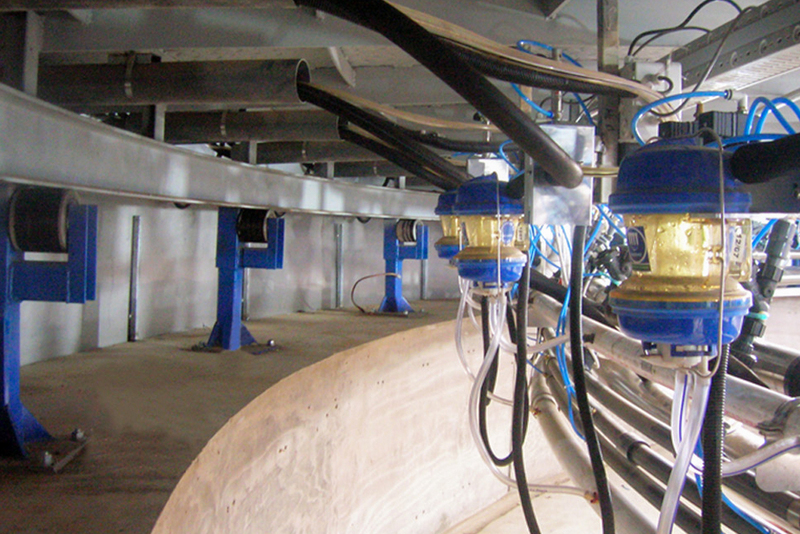 With the purpose of providing a greater protection to the electrical components located in the inferior part, the Madero Integra platform has an exterior slope that allows all the solids and liquids to fall outside of the rotary, this way avoiding the necessity of an internal drainage system and significantly facilitating the cleaning of the parlor. Take full control of your milking parlor with the different and diverse available automation systems.